There’s a new shingles vaccine and adults should be vaccinated with it starting at age 50, according to an advisory committee to the U.S. Centers for Disease Control and Prevention (CDC). When the first new shingles vaccine in 10 years was approved by the U.S. Food and Drug Administration (FDA) earlier this fall, the Advisory Committee on Immunization Practices (ACIP) recommended it be used instead of the existing one because it’s more effective, according to research published in the New England Journal of Medicine (NEJM). And – for the first time – the recommendation includes adults ages 50 through 59 among those who should be vaccinated against the virus. The new vaccine is also good news for older adults, who have the highest risk of getting shingles and the accompanying painful blisters and nerve pain. In people older than age 70, the new vaccine is 91 percent effective in preventing the virus, according to research. The varicella-zoster virus, commonly known as shingles, affects about 1 million people in the U.S. each year. It causes a painful rash on a person’s face or body which can be accompanied by nerve pain. In severe cases, shingles can lead to strokes, spinal cord injuries, loss of vision and encephalitis. The shingles virus is active in anyone who has had chickenpox. Once an episode of chickenpox ends, the varicella-zoster virus remains in nerve tissue inactively and can resurface years later as shingles. Flu – It’s recommended that adults get the flu vaccine every year. Every year in the United States, millions of people are sickened, hundreds of thousands are hospitalized and thousands or tens of thousands of people die from the flu, according to the CDC. Health authorities are reporting the 2017-2018 flu season is looking like it will be severe, and the CDC has documented widespread flu outbreaks in certain areas. Tetanus, pertussis and diphtheria – Every adult should get the Tdap vaccine once if they did not receive it as an adolescent to protect against pertussis (whooping cough), and then a Td (tetanus, diphtheria) booster shot every 10 years, according to the CDC. In addition, women should get the Tdap vaccine each time they are pregnant, preferably at 27 through 36 weeks, the CDC recommends. Pneumococcal– This vaccine protects against the bacteria that causes pneumonia, meningitis and sepsis. Studies show that the pneumococcal vaccine protects between 50 to 85 out of 100 healthy adults against pneumococcal disease, according to the CDC. Children under 2 years and adults over age 65 are at high risk for the conditions this vaccine protects against. Adults ages 65 and older need two pneumococcal vaccines, Dr. Regalado says, and it’s also important for this age group to discuss this with immunization with their doctor. Meningococcal – This vaccine protects against a type of bacteria that causes infections of the lining of the brain and spinal cord (meningitis) and bloodstream infections (bacteremia or septicemia), according to the CDC. Dr. Regalado says young adults who are going to college are at high risk of contracting the illnesses this vaccine protects against. HPV – The human papillomavirus (HPV) is very common – more than 80 million people in the U.S. are infected with it. The virus can lead to several types of cancer. Although HPV vaccination starts with children at age 11-12, many adults are within age range to get it, Dr. Regalado says. 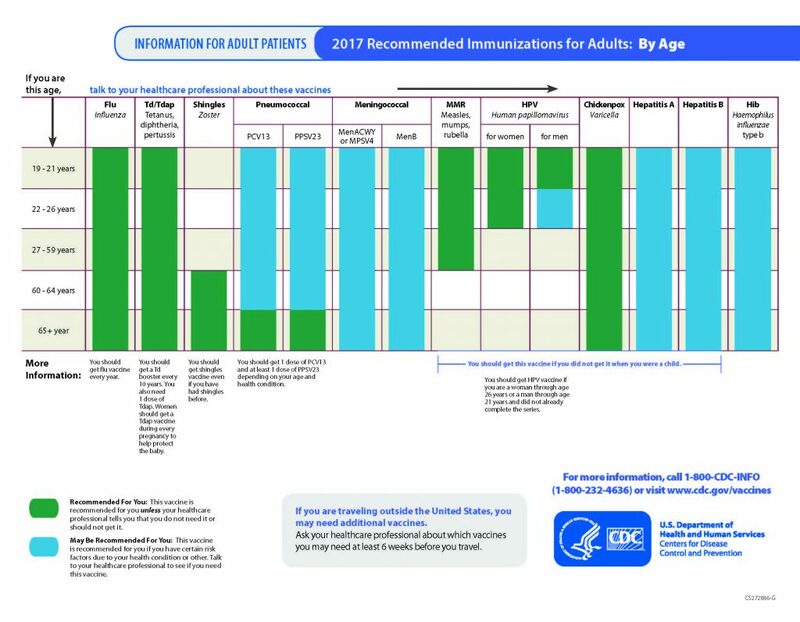 For more information about recommended immunizations for adults, click here to see a larger version of the chart below.